We care deeply about our customers and our top priority is to make you happy.If for any reason you are not fully satisfied, CONTACT US and we will do everything we can to help. So you can be confident with your purchase. Mode: Strong light, low light, SOS, flash. ★Easy to install, suitable for many models diameter handlebar. ★With solar panel ,It can automatically charge in the sun. Solar Powered. ★It can charge your mobilephone and other USB tail light when emergency. ★It can be used as a flashlight alone. ★Horn mode: 5 kinds of voice，long press the button for 5 seconds to change sounds. 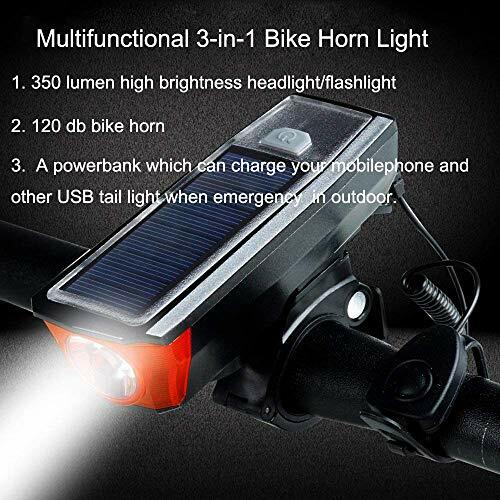 【Multifunctional 3-in-1 Bike Horn Light】Our bike light is not only a 350 lumen high brightness headlight(Effective distance 600ft),120 db bike horn(when the emergency happen you could simple push the switch) but also a powerbank which can charge your mobilephone and other USB tail light when emergency in outdoor. 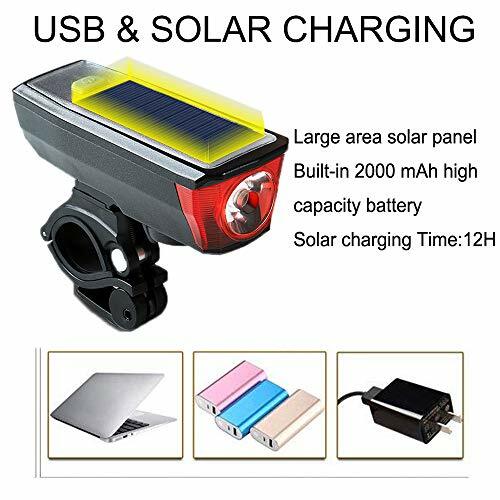 【USB or Solar Charging】Large area solar panel, built-in 2000 mAh high capacity battery.Pure solar charging can be fully charged in 12 hours. Also supports USB quick charge by powerbank, power socket, computer, 4 hours can be fully charged.Running time more than 8 hours. 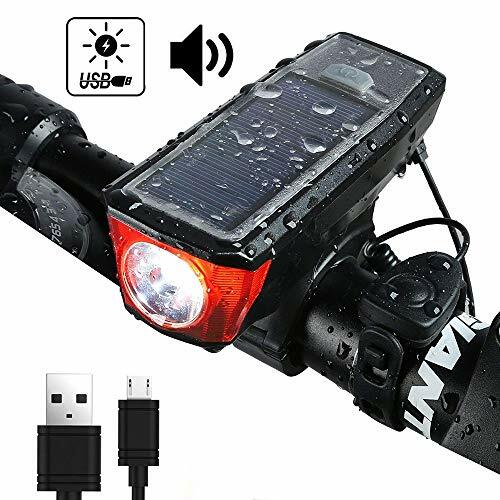 【4 Lightning Modes & 5 Horn Sounds】Our bike horn light has 4 different lighting modes(Strong light/Low light/SOS Flash/Fast Flash), 5 different sounds, long press the button for 5 seconds to change sounds. With light sensor switch, automatically open and close according to the light brightness. 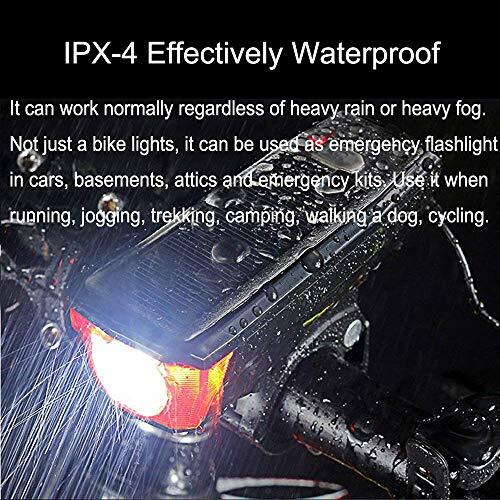 【Waterproof & Flashlight Function】Made of excellent materials, sealed and processed, IPX-4 effectively waterproof, it can work normally regardless of heavy rain or heavy fog. 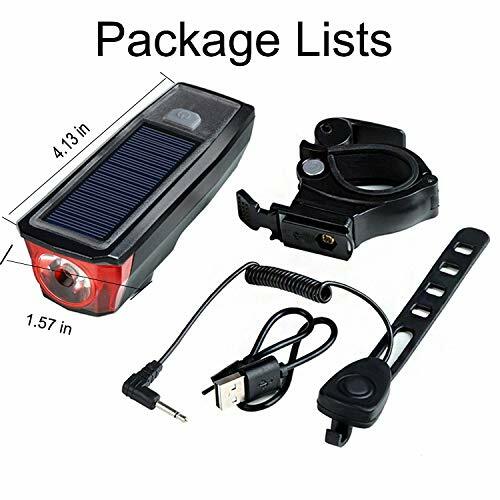 Not just a bike lights, it can be used as emergency flashlight in cars, basements, attics and emergency kits. Use it when running, jogging, trekking, camping, walking a dog, cycling. 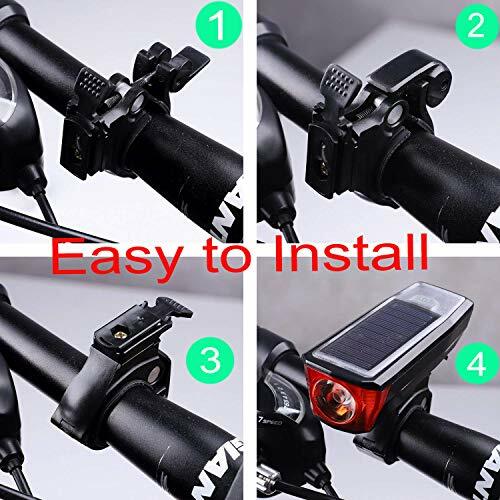 【Easy to Install and Detach】Come with a bicycle mount bracket & holder,if it is too big for handle bar, please try the rubber gasket.Dual switch design, easy to install and detached the bike light and bike horn. We care deeply about our customers and our top priority is to make you happy.If for any reason you are not fully satisfied, CONTACT US and we will do everything we can to help. So you can be confident with your purchase.